the old House of Representatives. It was designed by C. Howard Wattset. 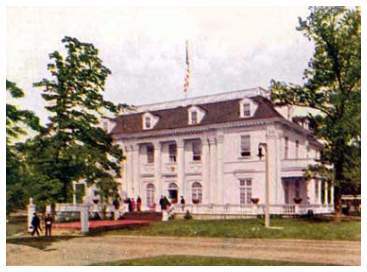 The porches at either end were similar to those of the old Longfellow house at Cambridge, Massachusetts. Sitting on elevated ground, the structure sported a front balustrade terrace at its front. The reception hall on the first floor resembled in part the old senate chamber in the statehouse, and the room above, the historical hall, was like the present senate chamber. Most of the furniture in the building was secured from the statehouse by Senator Fairbank. On the second floor on the main hall is the historical room, with its ceiling carried up into the third story. Many of the rooms were furnished with old heirloom furniture, going back to the pilgrim days, only state pride induced the owner to part with such valued historical items temporarily for exhibition at the World's Fair. Other artifacts included an embroidery created by Miles Standish's first wife- Rose. Standish's 1622 pipe was also on display. Also on display was a powder-horn carried at the battle of Bunker Hill, and a precious fragment of Paul Jone's flag. The mansion covered an area 100 by 70 feet and cost 21,000 dollars. 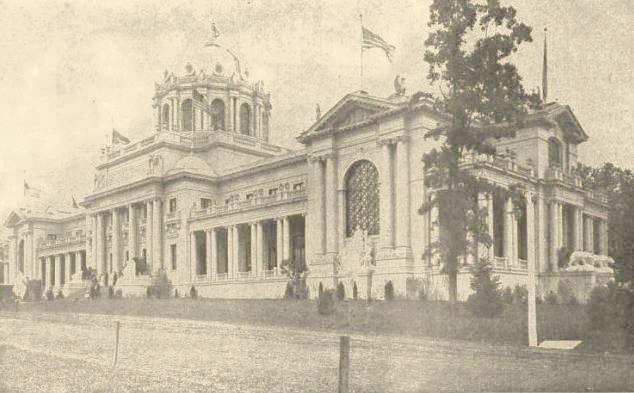 After the Fair, the building was dismantled and relocated for the 1905 Louis and Clark Centennial American Pacific Exposition and Oriental Fair in Portland, Oregon. Massachusetts was well represented in the different exhibit palaces, and in the Educational Building had an exhibit that cost 30,000 dollars.